If there’s one thing that everyone can agree on when they think about the West Country, it’s cider. For that is what this oft-forgotten end of the country does well; fermented apples, and sounding like pirates. I’m not much of a cider drinker these days, mainly due to overindulging when I first moved to Bristol and never quite being able to shake the memory of those first few vicious hangovers. But I still think that you can’t beat a good perry on a sunny day, or a dirty mulled scrumpy on a bitterly cold evening. 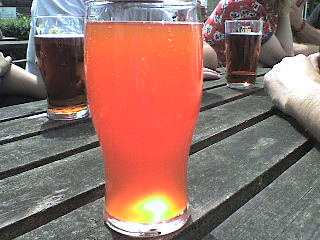 If you want the real deal when it comes to cider, the best thing I can suggest is a tour of Bristol’s establishments. Just watch out for the stronger varieties (quite a few can be over 8% volume) and whatever you do, stay away from Thatcher’s Cheddar Valley. The one and only. Also known as ‘The Cider Boat’. If you’re planning on loading up on cider in Bristol, you’ll have to include this place on your route at some point. Pro: Located very centrally, has over 40 ciders, a good snack selection (including a choice of Ploughman’s Lunches) and it’s based on a boat for chrissakes, all the better for channelling your inner pirate. Con: Due to the location and the above points, this place can get rammed on a sunny evening or at the weekend. If you’re happy to stand on the cobbles or sit with your legs hanging over the side of the quay though you’ll be fine. Summer is…sitting outside The Apple, all day. Near to the SS Great Britain, so not as central as The Apple; this is a proper traditional cider pub. My friend once asked if they did wine and the barkeep replied ‘We do light, and we do dark’. Jesus. Pro: Very traditional, not too busy, plenty of ciders (mostly local) to choose from. Con: You may get a funny look for not being local. On your head be it if you ask for anything other than cider. Not a cider pub as such, but worth a mention for not only channelling the local and misty-eyed vibe of a cider bar but also being one of the only places in town where you can still get a pint of Thatcher’s Original for under £3 – there are several other ciders on offer, plus the option to sit outside with cans of Natch, should you want to show off your red cider nose to the public at large. Con: The cider selection won’t appeal to all, it’s definitely at the rougher end of the scale. If your senses are a bit more refined it’s probably best to cross the road and head to The Grain Barge instead. Based in Clifton Village, this place is infamous for its Exhibtion Cider, which they will only sell in half pints as it’s so strong. 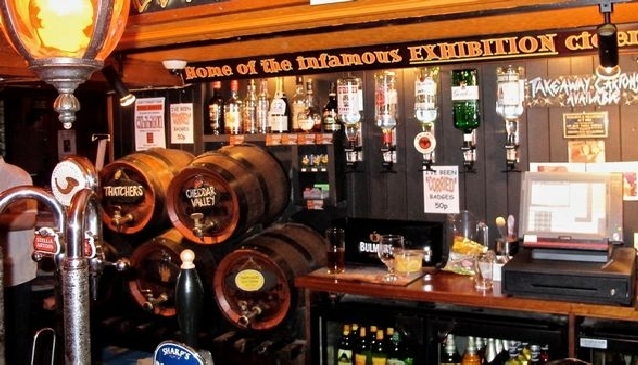 Every person I know in Bristol has some mad story associated with drinking Exhibition, it’s a bit of a Bristol institution. Pro: Great live music events, impressive cider selection, cosy atmosphere, Exhibition(when treated with respect). Con: Exhibition, if recommended dose is exceeded. At least you’ll have a hilarious anecdote in the place of where your dignity once stood. The cider selection at The Corrie Tap: A force to be reckoned with. A popular spot on Bristol’s waterfront, this modest chain specialise in cider, pies and pizza. ‘Nuff said. Pro: They do a good line in food, so you can line your stomach before continuing your cider quest. The cider tasting boards are also a good way to broaden your knowledge. Con: It’s more of a restaurant than a bar, and the size can mean that it can feel both a bit noisy and lacking in that cosy cider pub atmosphere. There are other traditional cider pubs just outside of the centre, such as The Apple Tree in Bedminster, The Old Stillage in St George and The Long Bar in Old Market. Due to the region’s history of cider production (and heavy consumption) though you can find a great selection of real ciders and perrys at most decent pubs across the city. I also think the Bristol Cider Shop in Wapping Wharf should get a shout out, as despite not being a pub they do an amazing selection of ciders & associated products and aren’t expensive. The staff are friendly and very knowledgable, plus you get lots of samples! They run cider tasting events throughout the month and you can even sit in with your cider and enjoy it with a tasty toastie – yum! So now you have no excuse to not be a cider drinker; load up some Wurzels on to your ghetto blaster, put on your best pirate voice, and cider ee up! I haven’t been to Bristol but I’ve been to Devon and Cornwall–love that part of your country and love the cider! You’re talking to a Somerset Lad, so when I first thought about booze it was cider all the way. And yes, the awful hangovers – and I love the phrase “Doom Juice” – that says it all! Glad you liked! Thought it was about time I did a post on cider. See you tomorrow! A great blog – I feel the need to visit Bristol now to try out some of these places. The recent rise in popularity of ciders has been incredible – I don’t have much time for the new range of designer ciders which only have a very brief acquaintance with the apple (Pete Brown has some interesting things to say on the subject: http://petebrown.blogspot.co.uk/2013/08/alcopop-drink-that-dare-not-speak-its.html), but I think they may be helping the real cider makers get their product appreciated, which is good. It is also leading to an increase in great pubs like these! I am not a drinker, but this is so very informative and well-written I feel I ought to look in on one or two (well, one, let’s not get carried away) of these places when next in Bristol. Just to try, and to make sure I literally don’t get carried away. I’m glad the post has inspired you! The best thing about a lot of these places is that they’re genuinely nice pubs to visit regardless of what you drink. Happy cidering! Yes, and pubs and bars are so much nicer places to go to socially now that there’s a smoking ban. Though I do find piped music distracting, one reason I don’t often go in these days! I know a few of these haunts from my time living in Bristol but have a few more to add to my list for the next time I’m up that way. Thanks! Definitely visit Bristol! I think it’s the most underrated city in England and probably the most appealing to people from other countries. Glad you enjoyed the post! I fell in love with cider when I studied at Oxford one semester in college, and this just makes me miss cider (and England, more generally) all the more. Most places in the US don’t have more than 2 choices (one being Strongbow) and they certainly don’t have it here in Uruguay. West country cider is fantastic. It’s one of the things I miss about living in England. I love cider! I may very use one of your recommendations for my night out this weekend!